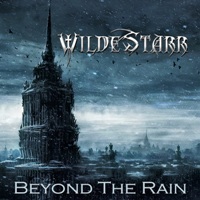 After ‘Arrival’ (2010) and ‘Tell Tale heart’ (2012) this is the third album recorded by the metal spouses Wilde and Starr. The songs are a lyrical expression of London’s pain, torment, hope and love caused by the suicide of her brother Gary in 2012. After a sombre, melodic intro, the pretty catchy title track chops his melodic, aggressive way thru your ears, while London proves she has a great metal voice and Dave delivers a great solo. In ‘Wires’ they choose a speed approach, with catchy vocal hook and lots of high pitched screams. ‘Double Red’ is a slower, darker affair somewhere between both previous efforts. The angry ‘Down Cold’ starts quietly, becomes a power ballad with catchy vocal hook enlaced with introspective passages. A bright mix! After that ‘Rage’ is up tempo despair with some double bass drums and a fine guitar solo. The poignant ‘Crimson’ follows as full-fledged power ballad, including a spine chilling guitar solo, while ‘Undersold’ is driven by double bass. After the melodic, staccato balls of ‘Shadow’, ‘Night Falls’ closes as, arguably, fastest track, but certainly one of the best. Good songs in a rough mix of power and heavy metal with great voice and stellar guitar. Na ‘Arrival’ (2010) en ‘Tell Tale heart’ (2012) is dit het derde album dat de metal echtgenoten Wilde en Starr inblikken. De songs zijn een lyrische weerslag van London’s pijn, vertwijfeling, hoop en liefde veroorzaakt door de zelfmoord van haar broer Gary in 2012. Na een somber, melodieuze intro, hakt het vrij catchy titelnummer zijn melodieuze agressie in uw oren, terwijl London bewijst dat ze een klasse metalstem heeft en Dave een prima solo ten beste geeft. In ‘Wires’ kiest men voor een speedy aanpak, met catchy vocale hook en tal van hoge screams. ‘Double Red’ is een trager, donker beest, dat ergens tussen beide voorgaande ligt. Het kwade ‘Down Cold’ begint rustig, wordt een power ballad met catchy vocale hook doorspekt met introspectieve stukken. Een schitterende mix! Daarna is ‘Rage’ uptempo wanhoop met wat dubbele bas drum en een mooie gitaarsolo. Het sterke ‘Crimson’ volgt als echte power ballad, inclusief kippenvel verwekkende gitaarsolo, terwijl ‘Undersold’ weer op dubbele bas teert. Na de melodieuze, staccato kracht van ‘Shadow’ sluit ‘Night Falls’ af, als, mijn inziens, snelste nummer en zeker één van de beste. Goeie songs in een ruig mengsel van power en heavy metal voorzien van grootse stem en prima gitaar.